Music Together is an internationally recognized, developmentally appropriate music and movement program for children from birth through grade two and the adults who love them. Originally offered to the public in 1987, it pioneered the concept of a research-based, early childhood music curriculum that strongly emphasizes and facilitates adult involvement. Music Together is currently in 3500 cities, 40 countries and on 5 continents. 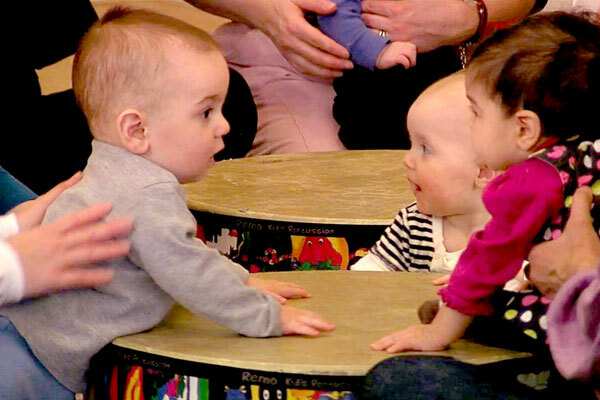 The Music Together® approach to early childhood music development is based on the belief that every child has musical ability which is as much a basic life skill as walking and talking. We believe all children can learn to sing in tune, keep a beat and participate with confidence and pleasure in the music, provided that their early environment supports such learning. Our classes provide a high quality, developmentally appropriate curriculum for children, birth through grade two, with playful activities to promote and support primary music development. 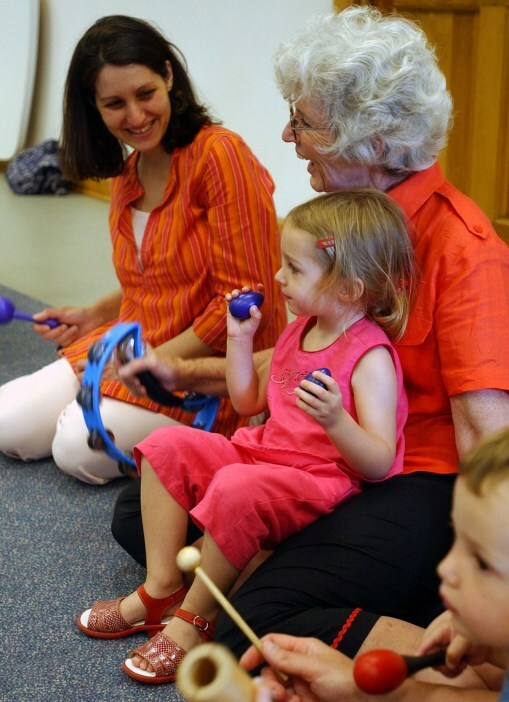 Children, their parents or primary caregivers ( nannies, grandparents etc..) meet 45 minutes per week to experience new songs, chants, movement activities, and instrumental jam sessions. In class, you and your child will experience the joy of music-making and the freedom to respond spontaneously to those experiences. Because young children instinctively respond to and imitate their loved ones, the active participation of parents and caregivers - regardless of musical ability! - is an essential part of the rich musical environment we create. Research has indicated that children learn best through play. Our teachers are specially trained to foster an enjoyable, easy atmosphere where adults can relax as they play musically with their children. In class, you and your child will have many opportunities to create and play - making up new words to songs, improvising rhythms, dancing freely or simply observing and taking it all in. - "My daughter is 2 1/2 and we have been in Anna's class together for almost year. She frequently requests music class songs as her bedtime songs, but the other evening she asked for "Mommy songs." I happily sang her part of James Taylor's "Carolina in My Mind." When I started her second song, she stopped me and said excitedly, "That sounds like the same author!" I was singing a different James Taylor song. I am delighted that she has learned to listen so closely. She was thrilled to learn that she was correct--it was the same "author." - "When we got home from class yesterday, My daughter went running to her toy box to pull out her instrument bag and asked me to make music with her! She also asked my husband the same thing when he got home from work hours later. When I told her I was emailing you about going to class this weekend, she picked up my tablet and told me she was going to email you to say thank you for a great class today. Then she grabbed her baby stroller and told me she would see me later because she was going to Ms. Anna's class. I thought this was all very sweet and wanted to share with you how happy you make her each week. Thank you so much for being such an important part of our week!" - "I wanted to tell you how much my son and I enjoyed the class. I decided to enroll my newborn at the recommendation of a friend, as a way to get out of the house during my maternity leave before I went back to work. Colleen is an excellent instructor and, to my surprise, my now four month old really enjoyed the class. I did not think an infant could get so much out of a music class. He went from sleeping through most of the class to being actively engaged. I even use the music to calm him down. My older son , who is almost three, did not attend class with us (he was in day care during my leave). We often listen to the CD in the car, and heard our older son start to sing along. This past Saturday, I took both my children -- my older son cannot stop talking about how much he loved music class. So much so I have decided to enroll both kids for the Spring session. We have gotten a lot out of the class, so I wanted to thank you personally." - "I wanted to mention that in the course of the past 5 or so weeks, I've noticed a real difference in the way my daughter responds to music and sings along. The Fireworks song and Trot Old Joe are two of her favorites. She also repeats words from songs more often now (music class songs and others too) -- some of it is just where she is with language development, learning new words every day, but I know a good deal of it comes from the encouragement she gets from class. So thanks!"